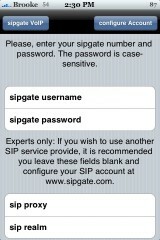 sipgate is an application that allows you to make calls, when on WiFi, using voice over IP. To sign-up for the free account, you will need to go to sipgate.com and select the Free Download button. This will bring you to a page where you will need to enter some info. Once you have done that, you will get an email with your sipgate number and password. 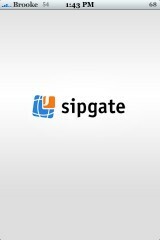 Now, you can go into Installer and install the sipgate application through the sipgate repository. 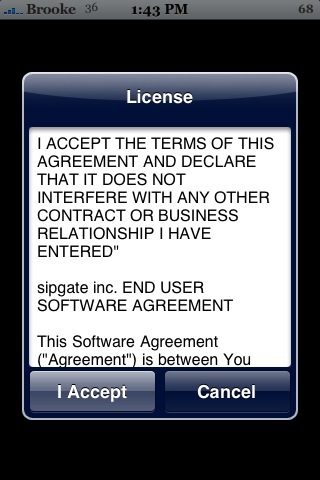 If you would like to read their Terms of Service before you install it, you can see them HERE. After you install the application and have it open for the first time, it will say authentication failed…this is because you have not configured your account yet. 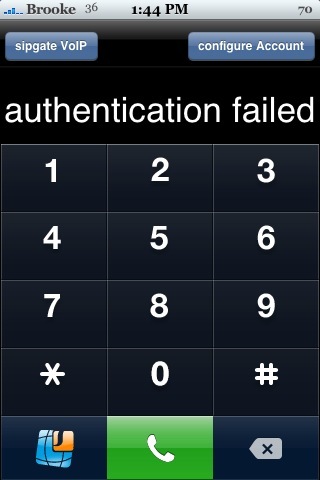 To do so, tap on the configure Account button in the upper right corner. Here you will enter your sipgate number as the username (that is the number you received in the email) and your password. Make sure you check the password in the email becuase it cuts the password off after 8 characters…so, double check to make sure you have the password entered correctly. 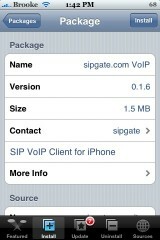 Once you have entered that information, you can select sipgate VoIP in the upper left corner. 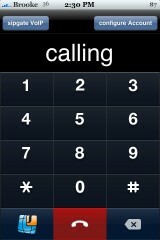 Now, just type in a phone number (with the area code) to make a call. Here was my experience using sipgate. I was able to call Doug’s regular cell phone number with no problem (they provide 111 minutes of free calls to domestic phones). However, neither Doug or I were able to receive an incoming call to sipgate. This is what the developer has to say about receiving incoming calls. At this time there is no meaningful support for incoming calls. 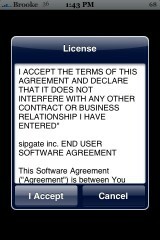 While you can answer incoming calls whenever sipgate is running on your iPhone it does not alert you, when the VoIP software is not running. The reason being the iPhone’s high power consumption while Wi-Fi is active. If we just suspended the software to monitor incoming calls, your battery would be empty in no time. We realized this is a halfhearted solution. We are working on improving this release. We were unable to receive calls to sipgate even when the application was open. You can go to sipgate.com and login to see how many of the 111 minutes you have used, how many minutes you have remaining and change your password. They also have a nice F.A.Q Page that is definitely worth checking out. 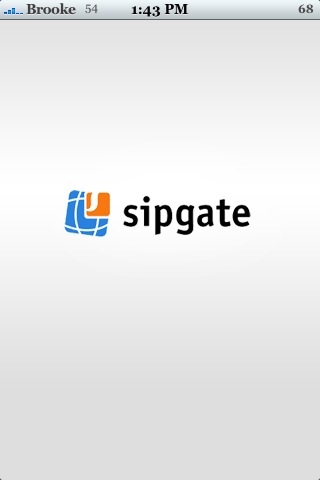 There is also a place to enter information from any VoIP service provider and use them through sipgate. Let me know in the comments what you think of this application. This 111 minutes is the in total, or monthly? it say: remote not found ..what’s problem?? same here, where re you from kocka? They are not offering additional minutes for funds, “at this time” so if you satisfy 111 then what? hmm..don’t we have that integrated in the fring app already? Can I just point out (in a friendly way lol), that SIP is Session Initiation Protocol, not VoIP which is Voice-over-Internet protocol, there is a subtle difference, mainly how SIP focuses on ip connects, while VoIP is transfers of audio packets (pieces of information) over the internet, just though I might tell you that! wat source is this from? It’s from the sipgate source. 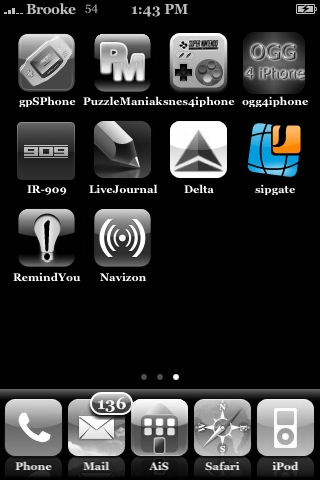 The sipgate source “http://iphone.sipgate.com” is not working, even though I added it to sources in Installer. Any suggestions….!!! Application. 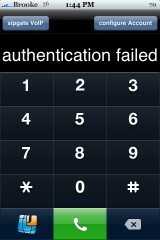 Any suggestions to fix this issue…..!!! Trying to install Sipgate… When I go to installer on my Iphone 2G I locate installer (version V4.0b8-1) I get an error message source is not valid. Is there an alternate source or location in cydia?